Venous hum is the phenomenon of producing humming sound in veins due to blood flow. This phenomenon is benign. The cardiac output which reaches to brain at resting state is 20 % of total cardiac output. The blood flows to the brain from heart via the internal carotid and arteries of vertebrae. This drains through the internal jugular veins and due to the blood flow in veins it produces humming sound which can be heard by the patient himself. This humming sound is produced due to the vibration of the veins happening due to blood flow in veins. The main cause behind the venous hum is the flow of blood which drains through the veins originating from the brain named jugular veins. The blood volume generated by the cardiac output at resting state is transferred to brain via internal carotid and arteries of vertebrae. The veins which drains the blood flow named jugular veins get vibrated when the blood strikes with the walls of the veins. 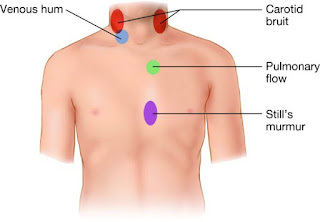 This vibration produces a humming sound at the portion near clavicle. This humming sound can be hear by the person himself as the vibration and sound is loud enough. Venous hum sound is produced and hear by the patient himself is the main symptom associated with it. Some other symptoms are the continuous production of murmur sound with diastolic blood pressure. The low frequency is another symptom. Sound may be intense and can be measured via grading system i.e. grade 1 to 2. Sound produced is like whining, roaring type. Whirring sound may also produce. Sound is heard clearly at the clavicle region near sternocleidomastoid muscle. There is also a particular treatment regarding sound. The modifications in posture may temporarily resolves these symptoms. The word venous hum itself defines the meaning i.e. humming sound in veins. The vibration occurs in the veins due to strike of blood to the walls of veins. This vibration will produce the humming sound which can be heard by the patient itself. The sound produced may be whirring, roaring type or whining type. The sound of the humming may closely resembles the murmuring sound produced in the heart. The venous hum may also be called nun’s murmur and bruit de diable means the devil’s noise. This sound can be differentiated with the heart murmur sound easily. Venous hum sound can be treated on the basis of cause diagnosed behind it. Jugular bulb high riding may require non treatment. Ligation of the internal jugular vein can be chosen as treatment for the venous hum. The ligation of the internal jugular veins is not recommended on routine basis due to the high risk profile as it can cause intracranial hypertension. If the diverticulum is diagnosed, then it can be treated with the surgical operation. In surgical operation, the walls of the veins are reconstructed which eliminates the production of humming sound.